I'd been dreaming about this shoot for awhile. Something very simple, clean, and utilizing the gorgeous mid century storefronts of downtown Overland Park. I had stumbled upon this location years ago during twilight and knew I had to shoot here. When Summer and Elliot approached me about a session to commemorate their first wedding anniversary I thought they'd be a good fit for this location. Summer referenced a specific past shoot and called out my draw toward minimal backdrops and simplicity. I had always imagined shooting very flat at this location so they seemed to be a perfect fit. However, I did't realize how perfect of a fit they'd be until they showed up. First of all, we didn't talk about outfits at all, their perfectly coordinated denim and tennis shoes attire was all them. I loved how it played up the Americana feel of the location, and really appreciated the more subtle touches, like Summer's simple white bandanna. 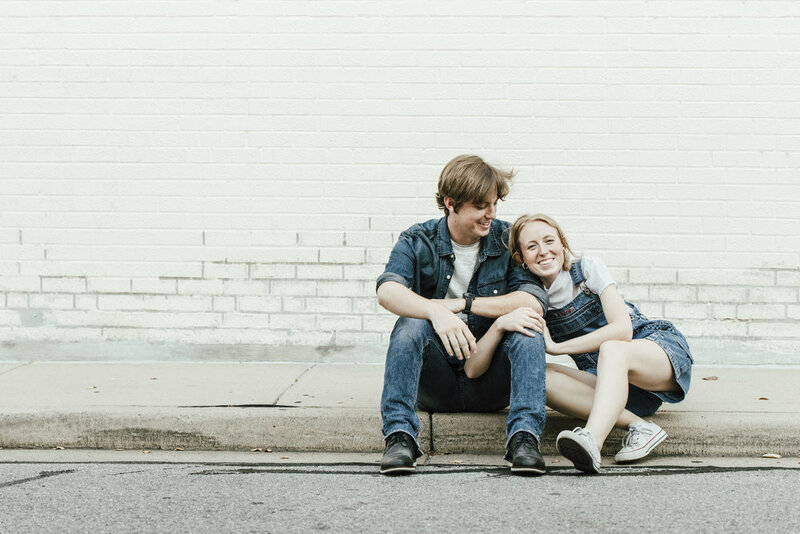 Style and technique aside, what made this shoot so special was Summer and Elliot's playfulness. They weren't uncomfortable in front of the camera and totally allowed me to capture their personalities and sweet interactions with ease. I'm not a pose based photographer, so being able to reduce my instructions down even more, to say something as simple as "go hang out over there and take up space" is super refreshing. This shoot is definitely a personal favorite of mine, and not just because I'd been dreaming of shooting here for years, but because these shots were a collaboration. There's no way these images would've come across as playful, sweet, and authentic with anyone else. GO TEAM.